This page is a collection of stories written by people associated with Fayette who wish to maintain the memory of events and people of the town’s past. Some of these writings are from personal memory while others have been researched to create a history of the city. Hopefully, none of these writings contain anything libelous or mean spirited in any way, but should you find something you feel defames any person, then please use the “Contacts” button (upper right of screen) to contact us. If you have material you believe would be of interest and would like to see published here, then please use the “Contacts” button to express your desire and you will be contacted. 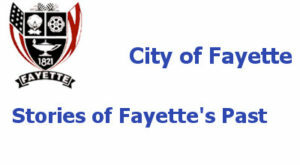 It is not the purpose of the City of Fayette to make this an official history of the city; but rather a means to give readers interested in the past a way to gain some insight into events and people that have given Fayette its character and history. The City of Fayette does not and cannot warrant the correctness of the details contained in these stories. The details contained in these writings have not been verified by any city representative and should not be considered authoritative or official in any sense. Restoring of an old house brings about a discovery and memories of a little girl who died. At one time Fayette was a producer of baby chicks. A glimpse of the fatality of contacting diseases many years ago. The William Walter (Will) Maddox That I Knew by Jack S. Butler, Sr.
Jack Butler grew up in Fayette in the 1920’s and 30’s before going to school at Auburn. He writes about Mr. Will Maddox and the lesson learned from a bet on the Joe Lewis – James J. Braddock fight. Jack Butler goes to college by Jack S. Butler, Sr.
Mr. Butler gives some insight into how he financed his college expenses. How “Cowboy” Strickland came by his name by Jack S. Butler, Sr.
Mr. Butler portrays a young man with a willingness and determination to take advantage of his opportunities. Robert Maddox writes of his time as a teenager working at his father’s gas station. Robert Maddox writes about the cold, cold night when Dad said, “boy, we’ve got a mess going on downtown. Your grandpa’s ponies have got out of the barn, six of them are downtown galloping all over the place…”. Gas stations were a lot different in the 1950’s than they are today. Looking for just the right car – a candy apple red MG.